The following passage comes from the author's Tennyson and Mid-Victorian Publishing, which Palgrave Macmillan published in 2016. It has been included in the Victorian Web with the kind permission of the author and publisher, which of course retains copyright. In April 2017 George P. Landow created this web version. Unless otherwise noted, all images are courtesy of the National Portrait Gallery, London. The decorated capital is based on Thomas Woolner's medallion portrait..
Short titles within parentheses refer to bibliographical items below in this column. Click on images to enlarge them and for more information. 1. The portraits were No. 483 and No. 597, see Catalogue of the Art Treasures of the United Kingdom Collected at Manchester in 1857. Supplemental Catalogue. Drawings and Sketches of Old Masters, Engravings, Photographs (London: Bradbury and Evans, 1857). 2. Hallam Tennyson, ‘Materials for a Life of A.T. Collected for my Children’, 4 vols 1894-5, III, 64, Tennyson Research Centre, Lincoln/BC/5102. 3. 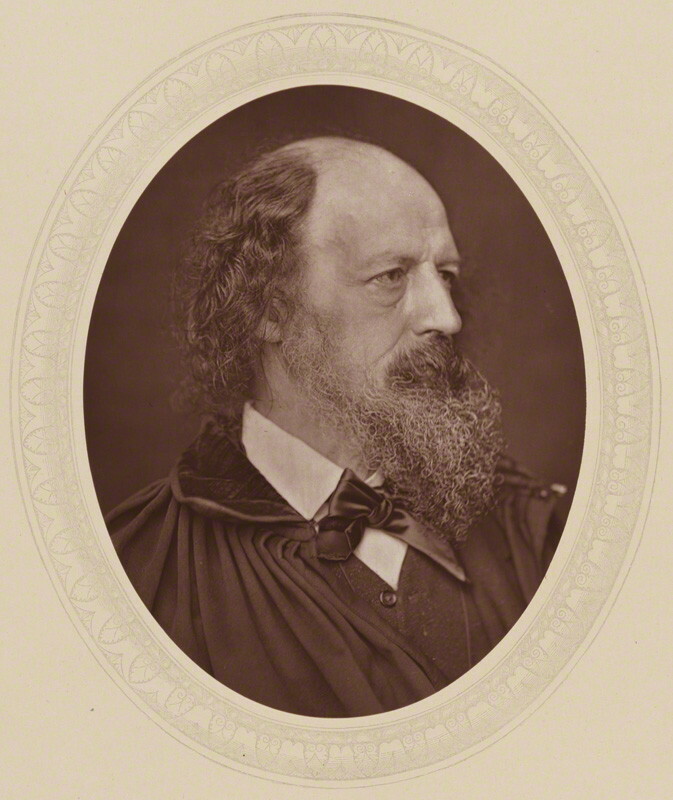 Cited in Christopher Ricks, ‘Tennyson, Alfred, first Baron Tennyson (1809–1892)’, Oxford Dictionary of National Biography [online] http://www.oxforddnb.com/article 27137 [accessed 25 April 2016]. 4. The ‘Dirty Monk’ portrait was published in Hallam’s Memoir, but the circulation of Cameron’s images in the 1860s was small in comparison to other portraits. 5. The National Magazine, November 1856, the engraving of Tennyson on p. 1, after a drawing by E. Morin. .
6. Mudd’s portrait was described as ‘no. 597 Alfred Tennyson by G. Downes’ which probably describes, George Downes of Cundall, Downes and Co. who published photographs by James Mudd, see Catalogue of the Manchester exhibition. 7. James Hoge, Lady Tennyson’s Journal (Charlottesville: University of Virginia Press, 1981), p. 101; an early portrait of Hallam and Lionel Tennyson from about this date is Tennyson Research Centre/Images/6040. Tennyson Research Centre/Images/6033 is dated by Ormond as 1857 but is more likely to be part of a group of photographs of c. 1862; see Richard Ormond, Early Victorian Portraits (London: Stationary Office Books, 1973) pp. 446-58. 9. Hoge, Lady Tennyson’s Journal, pp. 167, 174; Alfred Tennyson, The Letters of Alfred Lord Tennyson, ed. by Cecil Y. Lang and Edgar F. Shannon Jr. 3 vols (Oxford: Clarendon, 1982-1990), II 534. 11. ‘Photographic Exhibitions in Britain 1839-1865’ [online] http://peib.dmu.ac.uk, records that Jeffrey exhibited a photograph of Woolner’s bust in the Photographic Society Exhibition in 1859; for the 1862 Exhibition See ‘International Exhibition of 1862 Catalogue of the Photographs exhibited in Class XIV’ (London: Her Majesty’s Commissioners, 1862), p. 8. 15. See for a review of the exhibition see ‘The Photographic Society’, The Literary Gazette: A Weekly Journal of Literature, Science, and the Fine Arts, 2144 (20 February, 1858), 185-6, British Periodicals [online] http://www.proquest.com/ [accessed 25 April 2016]. This corresponds to the Mudd images in that one portrait showed Tennyson with a hat and one without. For attribution to Downes see ‘Photographic Exhibitions in Britain 1839-1865’ [online] http://peib.dmu.ac.uk. 18. NA 1/3/462 describes 'Photograph of Master Lionel Tennyson reclining against a fluted column, three quarter face, full length', which corresponds exactly with TRC/Images/6043. 20. National Archives: for Mayall see NA 1/6/515B, 1/6/515C, 1/6/516, 1/6/517, 1/6/518; for Elliot and Fry NA 1/9/571-3; for Jeffrey NA 1/9/504-8. 21. NA 1/6/788, 1/7/548, 549, 550,552, 553, 704; 1/8/456-7; 1/9/429, 484-5; 1/10/479-81; 1/11/22-5. 22. 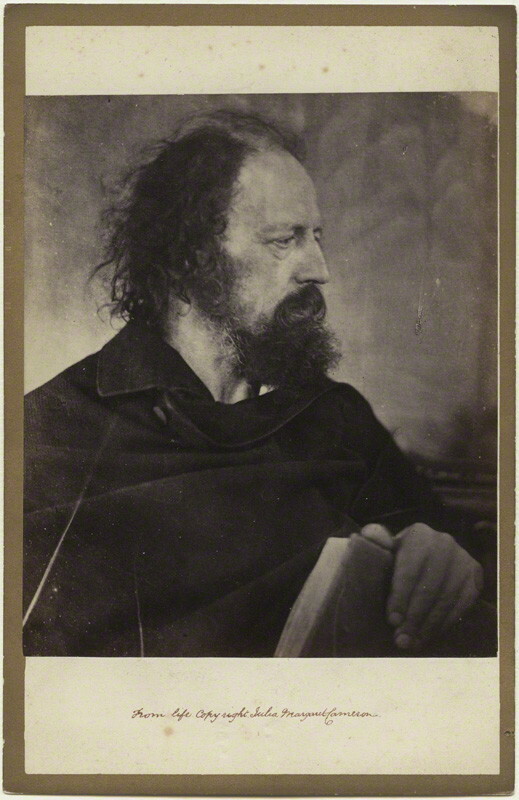 19 extant photographs of Tennyson by Cameron date between 1864 and 1869, although some were printed later, see Julian Cox and Colin Ford, Julia Margaret Cameron The Complete Photographs (Los Angeles: Getty Publications, 2003), pp. 354-59. For a list of ‘Selected Exhibitions see Cox and Ford, 538-541. Haweis, H. R. . Poets in the Pulpit. London: Samson Low, Marston, Searle, & Rivington, 1880. Jacobs, David L. ‘Rejlander, Oscar Gustave (c. 1813-75)’ in Encyclopaedia of Nineteenth Century Photography ed. John Hannavy. London: Routledge, 2008, p. 1188. Lukitsch, Joanne. Thomas Woolner: Seeing Sculpture Through Photography. Leeds: Henry Moore Institute, 2006. Plunkett, John. ‘Celebrity and Community: The Poetics of the Carte-de-Visite’ Journal of Victorian Culture 8.1 (2003): 55-79. Tennyson, Hallam. Alfred Lord Tennyson A Memoir. 2 vols. London: Macmillan, 1898. 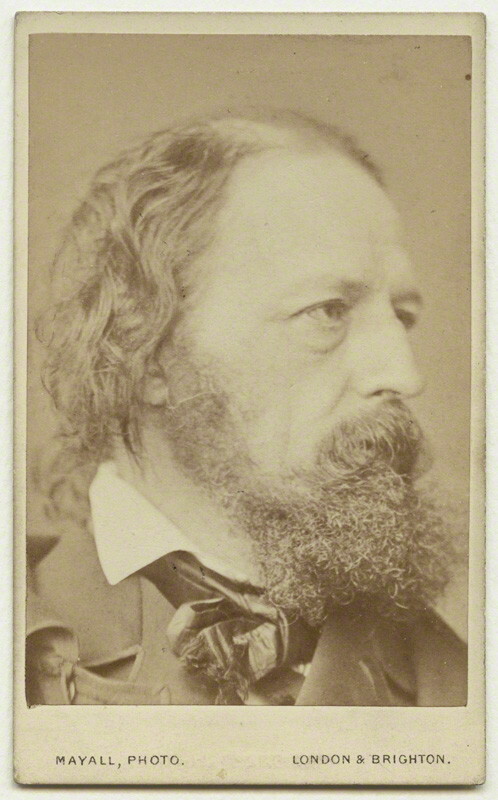 Three photographs of Tennyson by Cameron. 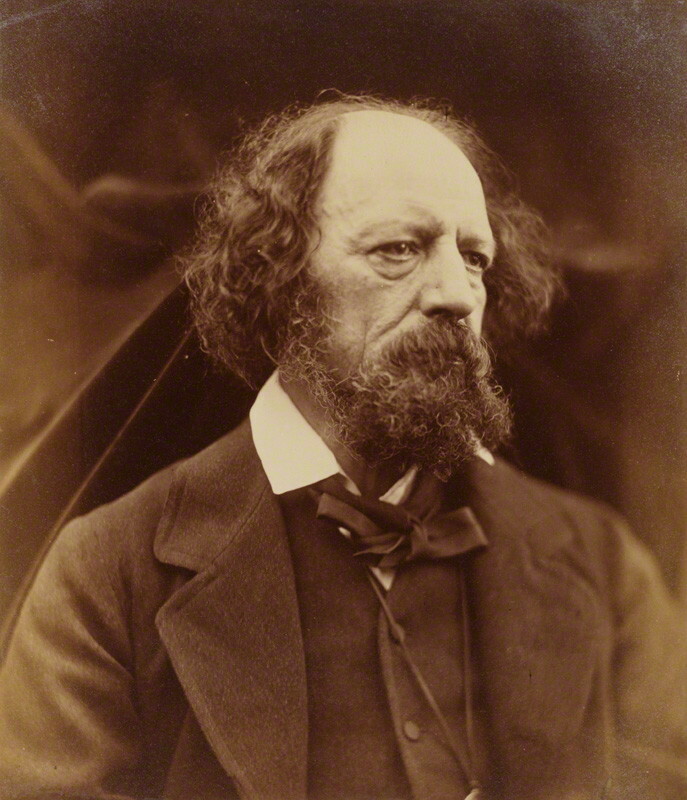 Four portraits of Tennyson by William Jeffrey, 1862-1865. Mayall, Jeffrey, Mudd and Rejlander were all professional photographers who made images of Tennyson and his family with their consent. Further compliance and even intimacy is implied by the fact that Mayall and Rejlander were invited into the family home at Farringford. This behaviour is not consistent with a retiring poet who hated portraiture and avoided publicity, although in some ways this was an understandable response to a new medium: photographic portraiture was becoming widespread and was a novelty for many middle-class people. In addition, photography was receiving enthusiastic Royal endorsement: Prince Albert’s portrait at the Manchester Art Treasures exhibition was the first time that a photograph of a member of the English Royal Family had been displayed publically and in 1862, Mayall published the Royal Album, which reputedly sold three to four million copies (Plunkett 61). Rejlander also had connections to the Royal Family as Queen Victoria purchased a copy of The Two Ways of Life for Prince Albert in 1857 (Jacobs 1188). 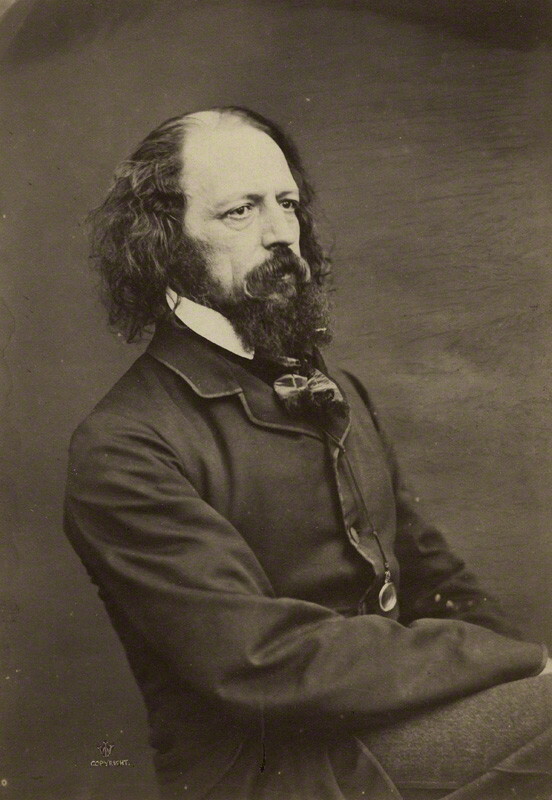 James Mudd’s popular portrait of Tennyson. Courtesy of the National Portrait Gallery, London. 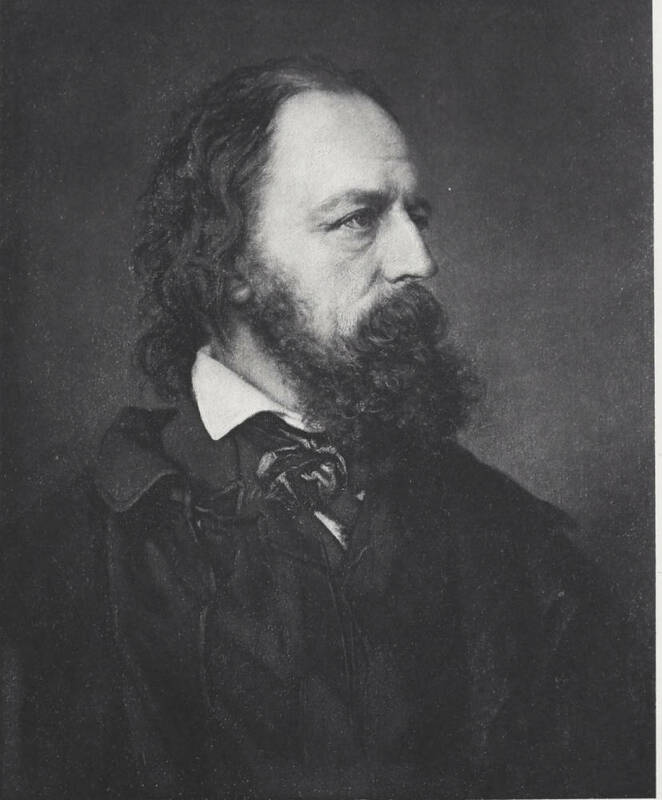 Of the early images, James Mudd’s portrait of Tennyson in a ‘wide-awake-hat’ published by Cundall and Downes seems to have been one of the most widely disseminated. A number of images can be associated with the same sitting although the most extant copies date from the early 1860s (see, for example, the National Portrait Gallery P34, x8005, and x13232). 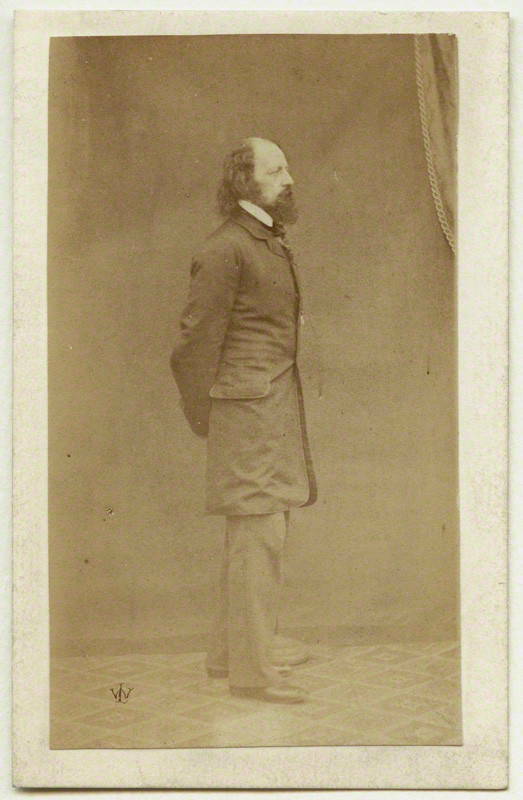 Two portraits of Tennyson, probably from the same group of images, were exhibited at the 1858 exhibition of the London Photographic Society, again attributed to George Downes.15 These images were certainly in carte de visite format by 1861 and probably earlier and were still being published decades later, for example in Haweis’s Poets in the Pulpit from 1880. Portraits by John Jabez Edwin Mayall, from 1864, the 1870s, and 1883. 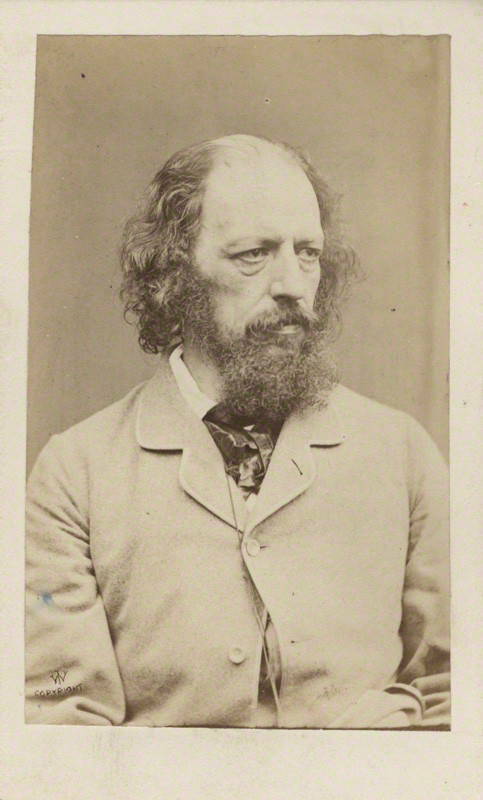 After Cameron’s activity, there were no more photographs of Tennyson registered at the copyright and stationers office until October 1881. 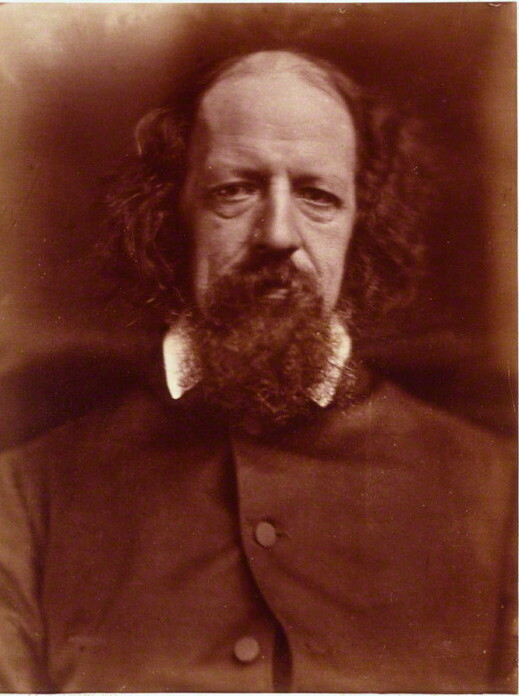 Cameron continued to photograph Tennyson throughout the 1860s and although some images are described by Cameron as ‘copyright’ and ‘registered’ she did not copyright her photographs at the stationers office after 1866 but exhibited portraits of Tennyson fairly regularly in the 1860s and 1870s.22 Cameron excepted, the almost total cessation of commercial photographic activity is striking. 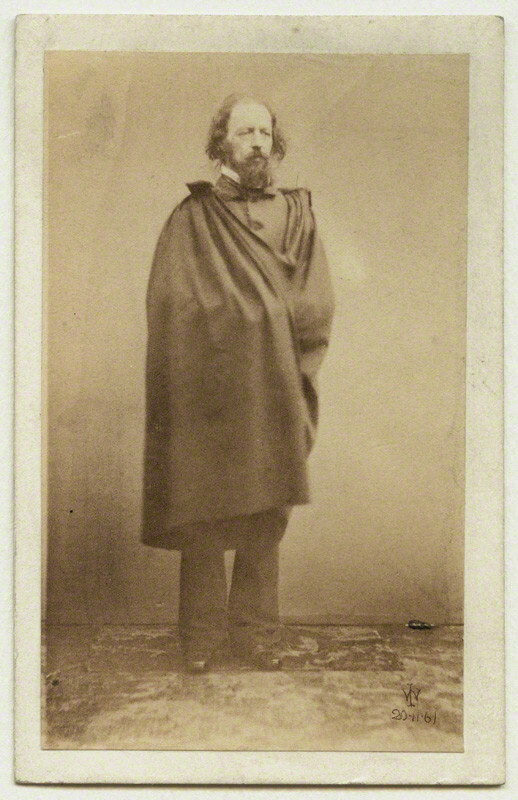 While it is tempting to see this as a product of the decline in Tennyson’s reputation it is also probably related to a contraction of interest in the carte de visite, enthusiasm for this novel format had waned by the mid 1860s (Plunkett 76). Another plausible explanation for the dramatic decline in activity is that Tennyson became far more wary of giving permission for photographic portraits - this would not necessarily have included Cameron, who was Tennyson’s friend and neighbour. 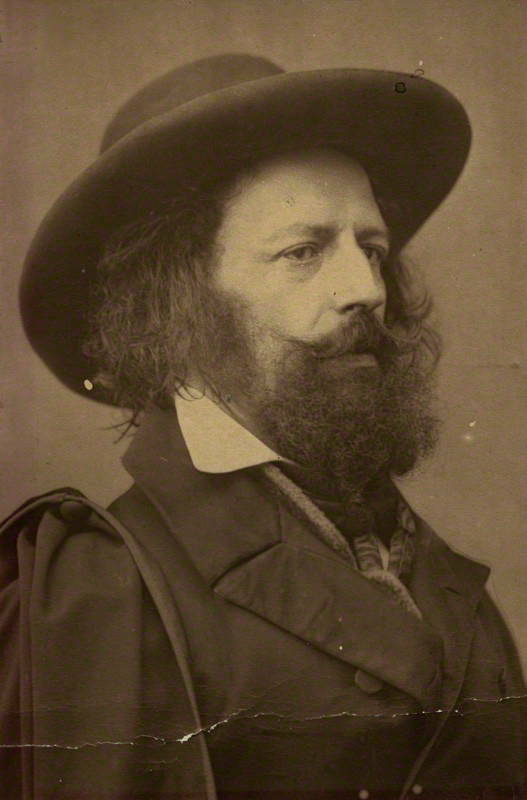 Tennyson seems to have become far more sensitive about his public image in the second half of the 1860s, no doubt a consequence of the cumulative circulation of various portraits resulting in scenes like his escape from admirers in Exeter. But this sensitivity was also a consequence of the activity of his publisher, who used Tennyson’s image in new and surprising ways - photography was part of this story but often as a mediating technology rather than the end product.